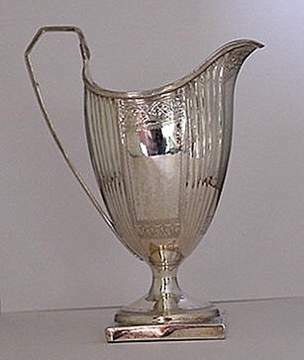 One of the commonest forms of fraud in the production of silver plate is transposition (the fraudulent use of legitimate hallmarks on an item that has never been assayed) and it has been used by unscrupulous silversmiths throughout the ages. It came to a head in England after the introduction of plate duty in 1720 and various steps were taken by the Goldsmiths’ Company to circumvent the practice. Although many of these steps were successful they are, as far as the wider public is concerned, esoteric and this allows that transposition is still happening today. Marks that have been 'let in' on plate which has never been to 'HalL' for assay can be fairly easily detected by breathing on the suspect surface and it will be observed that the condensation of one's breath shows up the seam round the marks. However there is one particular form of this fraud that cannot be detected in this way and a knowledge of both the positioning and the form of hallmarks is necessary. This fraud involves the reproduction of late 18th century small wares, such as cream jugs, that stand on square plinths. The method used is to construct the plinth in such a way that one side of it is composed of the stem of a genuine 18th century tea spoon so that the marks appear integral with the piece and have not been 'let in' on a larger surface. There are two things to look for when purchasing such a piece; the position of the marks and the order and form of the individual punch marks. 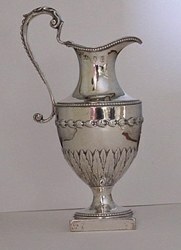 A genuine jug of this period will be marked in one of two places. Usually the marks were punched just below the rim and to the right of the handle. Although they can appear just below the lip late in the century. 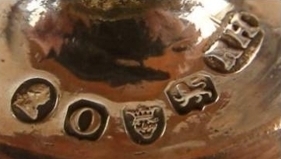 The order in which the Hallmarks appear on London made pieces is Lion, Leopard, Date and after 1784 Lion, Leopard, Date, Duty (see ADDENDA) but as this order does not apply on provincial pieces the position of the marks is paramount. However the outline to the individual punches is indicative and on the London lion, for instance, should be rectangular with canted top corners and an ogee base. If there is some reason why the maker would not want the marks to be applied in this position, because there is some decorative feature that he would not want spoiled for instance, then the marks will be found under the base of the piece and in this case the double mark punch was used and applied in the corners. When marked in this way the Lion and Leopard (in that order) will always be found together and the Date and Duty mark (in that order) will likewise always be together. If a jug is found to be marked along one side of its plinth then it is probably a fake. These marks were only applied to tea and other small spoons. It is illegal to sell such a piece and as it stands it is worthless. It should be sent to Goldsmiths' Hall in London where the mark will be struck through but left readable. It will also be given an LAO (London Assay Office) number which will be stamped near the falsely used mark. If required the piece will be assayed and, if found to be of sterling quality, given a modern hallmark which, of course, makes it worth less than an 18th century piece. 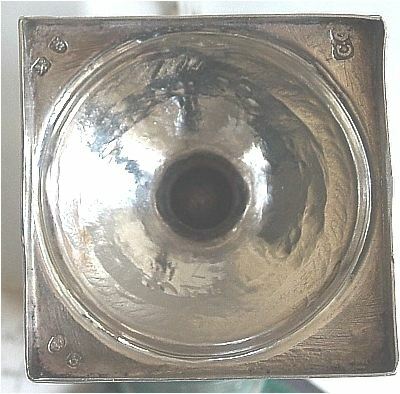 It should be added here that an unhallmarked piece that has been given an LAO number can be sold legally, although no claim can be made that it is made of silver of sterling standard. It can be worth nearly as much as a genuine piece to a collector of oddly marked pieces! Examination of the mark plate at Goldsmiths' Hall in London for the late 18th century shows that the intention was to strike the marks in the order Lion, Leopard, Date, Duty and indeed examination of items of plate of this period confirms this. That is why I have given this order here but, as with everything in life, there are exceptions. The underside of a muffineer made by Robert Hennell and marked in London in 1789 is just such an exception. It will be observed that the marks on this piece have been struck in the reverse order with the duty mark first and the lion last although they are in the right place. I am advised by the librarian at Goldsmiths’ Hall in London that they "would not raise any suspicion" in his mind. I can offer no explanation for this oddity but would say, however, that any hand punched marking (other than the clock face layout used on the underside of large hollow ware) of this period not in the order lion, leopard, date, duty should be viewed with suspicion and the advice of an expert sought before contemplating the purchase of such a piece. I have also seen this layout on a set of plates dated 1770, which should have been fly press marks in the order date, lion, leopard and similarly on the base of an oval tea pot of 1780 and the base of a hot water jug of 1787 both of which should have been in clock face format. A note I took at a seminar at Goldsmiths’ Hall on 'Fakes and Forgeries' reads: "London marks on base of hollow ware never in a straight line on antique plate"! This last statement appears to be unequivocal so that one must be very skeptical about any late 18th century large hollow ware not marked in a clock face fashion. 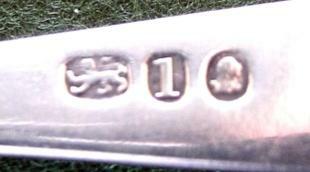 Between 1781 and 1785 the date letter came first and the lion was in an oval cartouche but I have not seen a fake made with a spoon of this date period. NB; there may be one out there! I have however seen a photograph of a jug marked on its plinth with the marks in the order lion, leopard, date, duty and for this I can offer no explanation!.